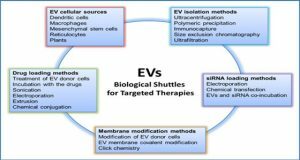 Extracellular vesicles, including exosomes, are small membranous vesicles released from many biotypes, contributing to the disease progression and spreading. These extracellular vesicles provide an important mode of cell-to-cell communication by delivering proteins, lipids and RNA to target cells. 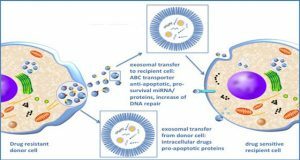 Exosomes are found associated with neurodegenerative diseases, which are characterised by progressive degeneration of neurons and often associated with misfolded protein. The common diseases include Parkinson’s disease (PD), Alzheimer’s diseases (AD), amyotrophic lateral sclerosis (ALS), and the prion diseases. 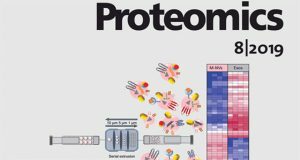 Of all neurodegenerative diseases, prion diseases are classified as the distinctive group owing to its transmissible and infectious nature of misfolded prion protein. 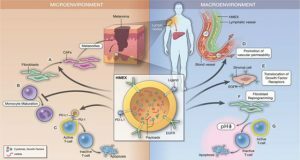 The infectious prion particles have been demonstrated to be present in exosomes to spread prion infectivity within cells. Similarly, misfolded proteins involved in other neurodegenerative diseases such as Amyloid-β and tau in AD, α-synuclein in PD, and superoxide dismutase 1 in ALS have been demonstrated to exploit exosomes for induced spreading of misfolded proteins in a prion-like mechanism. Furthermore, RNA molecules can be taken up by the recipient cells as cargo in exosomes. These RNAs can module the expression of the target genes by repressing or inhibiting protein translation. Upon inward budding of the membrane, the cargo is packed into intraluminal vesicles (ILV) within multivesicular bodies (MVBs) after endocytosis into early endosome. 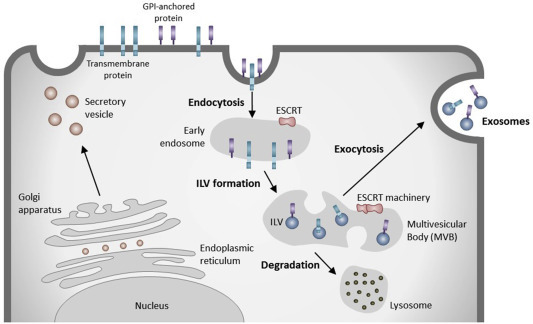 Several molecules are involved to facilitate the biogenesis of ILVs, such as the ESCRT (endosomal sorting complexes required for transport) machinery and lipids. There are two different fates for MVBs. The MVBs can fuse with lysosomes leading to degradation of the protein. 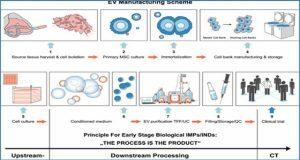 An alternative route to lysosomal degradation is the fusion between MVBs and plasma membrane, resulting in the release of intraluminal vesicles into extracellular environment as exosomes.